I have known about my bisexuality since 2016 with only three people knowing until 25th February 2019. I will not lie, I was scared. I know people who are not the most sensitive or accepting, but I realised that I cannot keep lying to myself because of a few people. However, I lied to people for a long time. I would get scared when people questioned my support for the community and it would break my heart to say “I’m not a part of it, I’m just an ally”. It was like I wanted to fight for our rights without being recognised as a part of it. I don’t know why but it was scary. 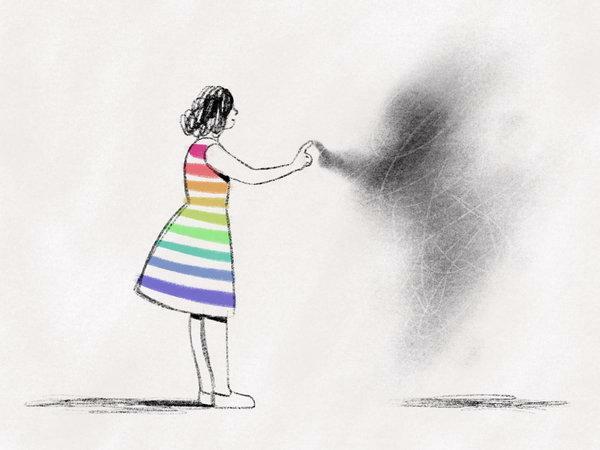 I was probably scared of all the attacks and stigma I would encounter if I came out, and back then, hiding behind the word ally seemed a lot safer. I used to do that until last year when someone said “You don’t know much, you’re a privileged ally” and I felt ashamed of my lies. I was confused for the longest time because I used to think that there are just gay boys/girls and heterosexual boys/girls. I did not know about bisexuality until class 9th. Before that, I knew that I wasn’t solely attracted to women because I liked men. That cancelled out me being gay but that also cancelled out me being “straight”. For a while, I even thought that maybe I like girls because I’m in an all-girls school. Yeah, I was stupid, bisexual and confused with a major lack of information I wish I had access to. I have been friends with/dated men who have told me that I don’t know what it feels like to suppress your attraction towards a girl. Lol. There have been quite a few ladies I have had feelings for which were more than just “She’s so cool, I wanna be her friend”. It is tough to see a stunning girl, be completely baffled by her beauty and pretend to not be attracted. There are a lot of girls who probably think that I’m weird because I was very nervous and awkward while talking to them because I was struggling with my bisexuality. There have been times when people have said that I look good with a female friend. Those compliments would leave me awkward as hell. My first thought would always be “Do they know?” I would not hold hands or hug my friends until class 11th because of the fear of somehow revealing myself. That was until I stopped caring in class 11th and hugged everyone, enough to be known as the person who gives the best hugs. But compliments still always freaked me out. I used to test the level of acceptance I would receive from friends by sneakily checking. I was always open about my attraction towards celebrities like Beyoncé and Perrie Edwards. Therefore, I would say mildly sexual things about these celebrities and test the responses of my friends. Some of them behaved as if being a lesbian was a bad thing and I stopped being friends with them. It was sad at first but then I realised that it is better to befriend someone who accepts me than someone who is “grossed out” by me and mine. This is very embarrassing but for one and a half years I always had a boy at my arms. Either a boyfriend or just a non committal thing because I was terrified of people finding out that I liked girls too. Therefore, a very intelligent me thought that if I’m with a guy, even if I cannot stand him for more than an hour, people won’t find out. Very smart of me. So, to the guys I left suddenly and/or with a weird explanation from 2016 to mid-2017, I was struggling. I’m sorry. Some of you were amazing. To anyone struggling with their sexuality, it is okay. There is no rush. I used to think that nobody will accept me but there will be people who will love and accept you. I got support from unexpected people and it was beautiful. You are valid and loved. Stay strong, hang in there. Eishita is a 17 year old from Lucknow, an aspiring filmmaker and a writer. She came out as a bisexual female right before ending high school, something that she had promised herself to do.